If you have been around my blog over the last few years, you know that art camp week is a crazy week in my household. In fact, we have the most campers we have ever had. whew. We are AT capacity! Here are a few pictures of the kids in action. For new visitors, I'll give you a run down. The kids come to camp and participate in either photography or art/theatre. If the kids want to do both, they do both the morning and afternoon session. This year, we have 14 all day campers. We take PreK (fully potty-trained 3 years old) up to 6th grade for art/theatre and 4th grade-8th grade in photography. We have a total of 104 campers! The art/theatre kids have 3 rotations each day. Art, acting, and set/props. On the first day I had the kids make terracotta plaques. We were so busy I forgot to take pictures in action. Thankfully a local reporter came and got some great pictures! Thanks The Flash Today! And they even got a picture of me in action! Cool. Here are some of the finished pieces. 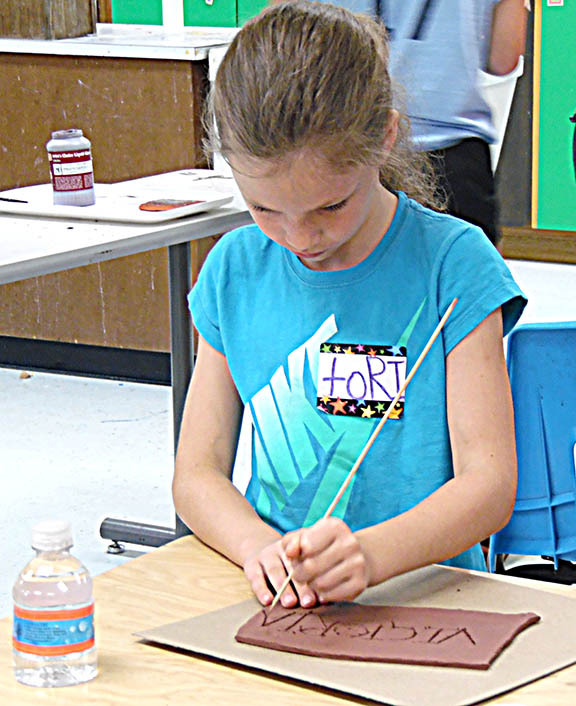 Nope, not fine art, but the campers had a great time and they learned a lot about clay and the glazing, firing process. I have to count that as a successful project even if I'm not necessarily in love with the product. We also did the first step for abstract watercolor paintings. On day 2, the campers continued to work on their watercolor paintings. I think this was the most successful project in terms of art. But it has taken the longest. And we tie dyed.. 104 camper shirts plus workers. oh my. You can't even imagine the mess. Or the staining on my hands from working with fabric ink all day. But today is day 4. And that means wrapping up all the art projects for me and the kids will practice their show. One combined performance this afternoon and another year will be complete. It's a hard week, but these kids love camp.